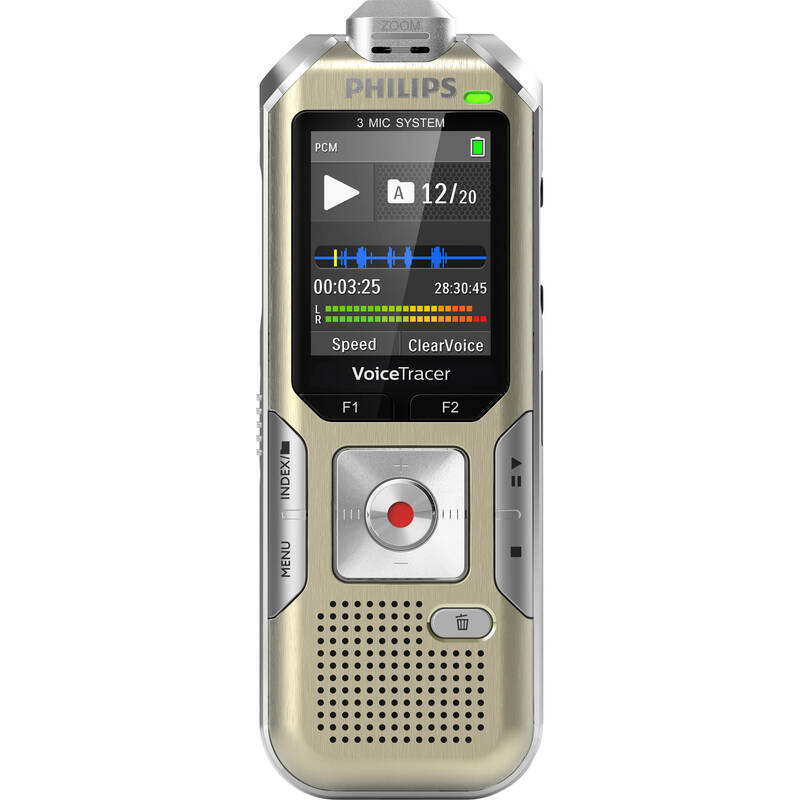 The Philips DVT6510 VoiceTracer is a portable, digital audio recorder designed to provide flexible, high-quality audio recording options and plug-and-play computer integration for meetings, lectures, concerts, and more. It features three built-in microphones and automatic adjustment of audio-quality recording settings. Its automatic zoom functionality delivers focused, directional sound pickup, ideal for distant sources. It includes an XLR to 3.5mm cable for easy connection of an external microphone or an instrument such as a guitar, bass, or keyboard. Start recording at the touch of a button, or have the record function begin automatically via a timer or voice activation. You can even capture the last five seconds before you pressed the record key! Record in PCM (WAV) or MP3 format at up to 44.1 kHz resolution to the internal 8GB memory, or utilize microSD cards (available separately) for up to 32GB of additional memory per card. The low-noise, three-mic system allows stereo recording with reduced handling noise. The AutoAdjust+ algorithm analyzes incoming audio, then automatically chooses audio settings such as microphone sensitivity, wind filter, and noise reduction. 3-Mic AutoZoom+ technology suppresses surrounding noises for improved clarity of distant sources. A motion sensor automatically selects microphone sensitivity to optimize gain for each situation. Recording time, battery status, stereo volume meters, and more are shown on the 1.77” backlit LCD color display. Audition files in slow, normal, or fast playback speed via the built-in 28mm speaker, or connect your favorite headphones to the 3.5mm jack for isolated listening. 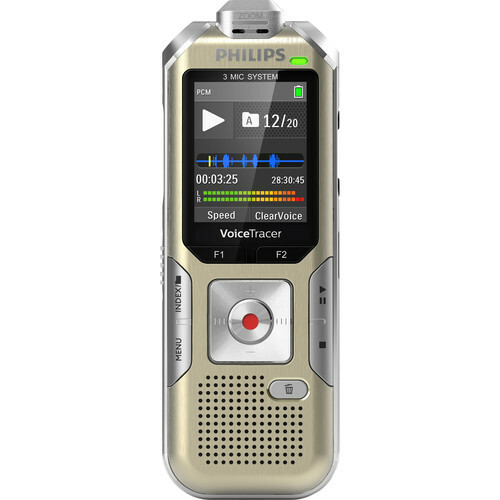 The DVT6510 VoiceTracer is powered by a built-in, rechargeable LiPo battery, which provides up to 50 hours of use. Alternatively, its high-speed USB 2.0 interface allows you to connect it to a computer running Mac OS X, Windows, or Linux. The included wireless remote offers convenient control of record, pause, and stop functions. The DVT6510 boasts an array of three microphones to deliver strong left and right channel separation and a stable center signal presence. The mic suspension system minimizes handling noise and aids the capsules in capturing anything from soft speech to loud drums. A built-in motion sensor detects the recorder when it is placed on a desk or held, and selects the microphone sensitivity to suit the recording situation, preventing you from accidentally blocking the audio you want to record. The pre-recording function allows you to record the last five seconds before you press the record key. The device switches into a standby mode and records a five-second loop without saving it. Upon pressing the record key, the DVT6510 will save the five-second loop. This feature allows you to spontaneously record important parts of a conversation. Record in WAV format to maintain optimal audio resolution, or use MP3 format to save space and take advantage of near-universal playback and sharing functionality. The included wireless remote control enables convenient placement of the recorder to best meet the needs of the audio environment while maintaining ease of operation. Start, pause, and stop recording without having to clumsily reach over things, even from a distance. The high-capacity internal lithium-ion polymer battery provides up to 50 hours of battery life, and can be easily charged through a standard micro-USB jack. Take on extra-long recording sessions knowing that your recorder will always be ready to work when you are. Thanks to plug-and-play functionality in Mac OS X, Windows, and Linux, you can quickly access your recordings without installing any additional software. The recorder is automatically displayed as a removable drive once connected to your computer via USB. It can also be used as a convenient way to store, back up, and share files. Capture and store up to 88 days of continuous recording thanks to the 8GB of internal memory. Virtually unlimited recording and storage capacity via a microSD memory card slot supporting up to 32GB of additional memory. The DVT6510's robust and lightweight design maximizes comfort, and the metal surface creates a robust shell around the device. The XLR to 3.5mm adapter cable allows you to connect an external microphone or an instrument such as a guitar, bass, or keyboard directly to the recorder. Box Dimensions (LxWxH) 6.65 x 5.35 x 2.05"